Proposed commercial project for a lobby! Designing window covering with the WOW factor! That was the goal for this commercial project. The client wants simplicity, uniqueness, and quality. Take a look at the drawing below. 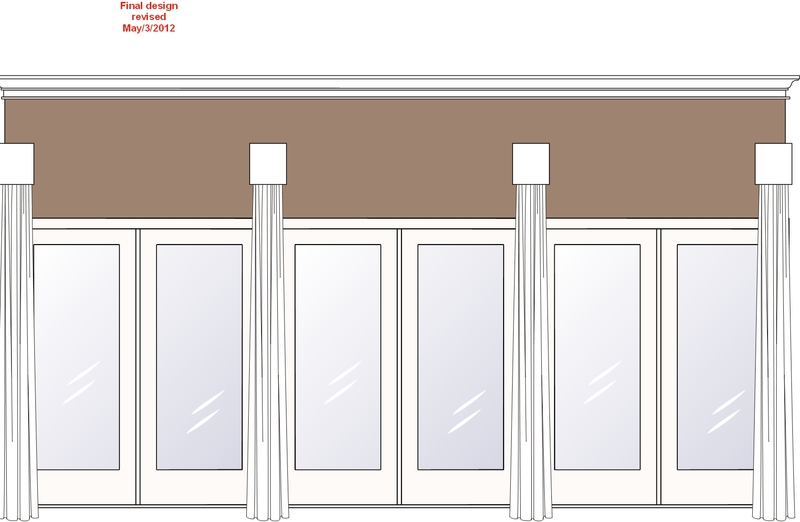 The idea was to use the fabric in a way to create columns and define the doors shown in the sketch. The fabric is white and will look stunning against the beautiful taupe wall. We provide unique designs for our residential and commercial clients. One hour free consultation, and a free phone consultation are available. Please call (630) 420-0800. Window Covering Ideas for your home! Window coverings can be the focal point to your rooms. It adds warmth, beauty, and luxury. Whether it is simple or elaborate, it provides texture, color, and pattern. Here are some illustrations of window fashion ideas! For creative window Treatments, call (630) 420-0800. Take advantage of our free phone consultation! A Dining Room Design, with the wow factor!Naperville Illinois. What was the client’s desire for this beautiful dining room? I get a call from this wonderful client that I met in the mid nineties and been working with her since then. Her house located in Naperville, Dupage county Illinois, saw three different changes since then. She likes to update her house with new designs about every five to six years, and she gets so much joy each time with the transformation. This time it is her dining room, her dream is to have a dining room that she could use every now and then for her, her husband, and the children when they come for visit. She wanted a dining room that is formal enough for guests, yet it is user friendly for every day use. She loves painted furniture, therefore we had her oak colonial dining table to be faux painted and distressed with several layers of paint to give depth to the piece in addition adding distressing where it looked natural from wear and tear of years of use. Her draperies came out looking stunning! We have selected together a cotton fabric printed with fruits and a color scheme that works with the rest of the house. The fabric was a classic, though what made the draperies so special are the banding on the leading edges of each panel, a solid yellow cotton was selected that worked amazingly well with the main body of the drapery, the faux finished table and the wall paint. Grommets were inserted along the length of the panels, right on the banding and a braid fringe was threaded through the grommets! We both were so impressed by that look and felt very proud! Now that what we call ( THE WOW FACTOR)! Call us for a free consultation(630)420-0800. Fabric and braid trim Kravet, Banding RM COCO, Hardware: RM COCO, Grommets Rowley company.